The United Kingdom of Great Britain and Northern Ireland's Department for International Development (DFID) mandated the International Trade Centre (ITC) to design and implement a project, called 'Supporting India's Trade and Investment Preferences for Africa' (SITA). The Confederation of Indian Industry (CII) is the implementation partner for the project in India. Speaking at an event to mark the launch of the project, Sumanta Chaudhuri, Joint Secretary, Department of Commerce, Government of India stated that the India Africa relationship was based on collaboration and participation and the SITA project fits well within that framework. He felt that the SITA project would help take the India Africa economic relationship to a different level. Despite an enormous untapped potential for trade expansion between India and Africa, data reveal that a limited number of products are currently being traded. India's trade with Africa is concentrated in certain sectors and countries, and it is dominated by exports of primary commodities. While the potential for export diversification exists, it may not be realized without targeted intervention. 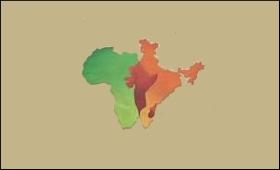 India is well-positioned as a partner to improve the productive and export capacities of African partner countries. With the growing importance of South-South cooperation, India's expertise can be leveraged to build trade capacities in African partner countries through the sharing of knowledge, technology and lessons learnt. The project responds to the challenges that selected East African countries - Ethiopia, Kenya, Rwanda, Uganda and the United Republic of Tanzania - face in increasing and diversifying exports. It also addresses trade priorities of the beneficiary countries so they can achieve sustainable development. According to Arancha Gonzalez, Executive Director, International Trade Centre, the initial focus of SITA was to explore how East African countries could enhance their exports to India. It has now grown into a much larger project which is aimed at boosting trade as well as foster foreign direct investment between India and East Africa as well as the rest of the world. Speaking at the session, Yaduvendra Mathur, Chairman and Managing Director, Export-Import Bank of India stated that the SITA Project was a perfect example of South-South cooperation and would promote the development of value chains between India and East Africa. Addressing the participants, Sameer Munjal, Chairman, CII Haryana State Council and Managing Director, Satyam Auto Components highlighted the need to promote Investment-led Trade to could help East African countries move up the value chain in terms of its exports and correct the trade imbalance between India and East Africa. He stated that the SITA project is uniquely positioned to help facilitate such a partnership between India and East Africa. Tamar Bello, Officiating Head, DFID India stated that the UK was ready to provide hands on support to a number of export sectors in Africa. She felt that the SITA project would be a tool to help eradicate poverty in the region.